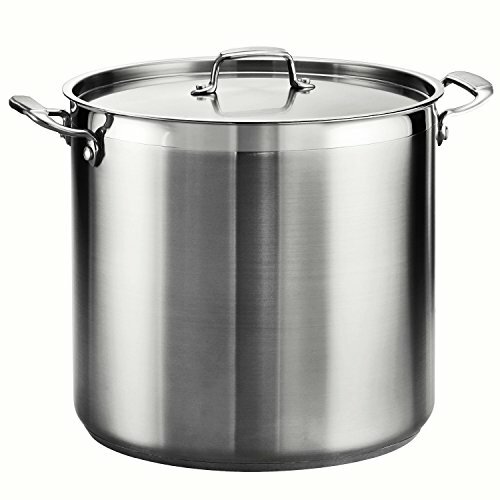 Tramontina's gourmet stainless steel 24 Qt stock pot provides exceptional performance combined with the impeccable beauty, durability and quality of stainless steel. Its base is impact-bonded with three layers, consisting of of an inner layer of 18/10 stainless steel, an aluminum core for conductivity and even heat distribution, and magnetic stainless steel outer layer which making it perfect for induction-ready cooktops. The Tramontina gourmet stainless steel 24 Qt stock pot rovides great all-in-one functionality for your cooking needs as stock pots are integral for making large batches of stew, soups, vegetables and seafood. The quality material of this stock pot ensures that it will last for a lifetime. Featuring an 18/10 stainless steel lid it also comes with riveted, precision cast stainless steel handles to give you that solid reliability you want when handling large amounts of food. This versatile stock pot is part of Tramontina's gourmet collection, a series of premium products engineered and manufactured with the finest design, materials and workmanship, outperforming similar products within the market and delivering the best quality and value to the cooking professional and enthusiast alike. It will perform exceptionally and is an elegant addition to your kitchen. Compatible with gas, electric, ceramic glass and induction cooktops. Diswasher and oven-safe (up to 500 f or 260 c). NSF-certified, assembled and packaged in USA and offered under a lifetime warranty.